The Plan: Our goal is to have multiple people control one robot via their brain waves. 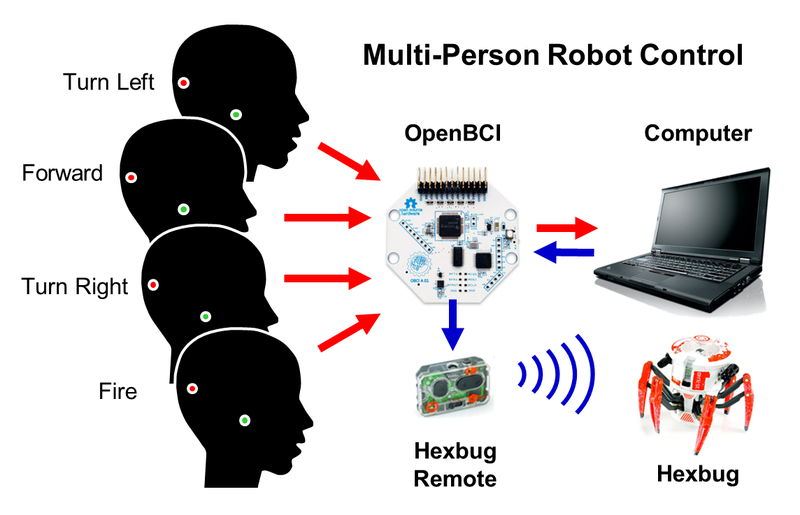 To do this, we aimed to connect multiple people to a single OpenBCI board. I have never connected multiple people to one EEG system before, so this was pretty exciting for me. As shown in the figure below, the idea is that each player is responsible for just one of the robot's actions -- one player is responsible for "Turn Left", another for "Turn Right", etc. Since the robot has four actions (Left, Right, Forward, Fire), we can have up to four players. connect four people to one OpenBCI board and work cooperatively! EEG Setup: To detect these eyes-closed Alpha waves, we put one electrode on the back of a player's head over the visual cortex (position "O1" in the 10-20 system). We put another electrode on one ear lobe to act as the EEG reference. Finally, we put a third electrode on the other ear lobe to act as the EEG Bias. 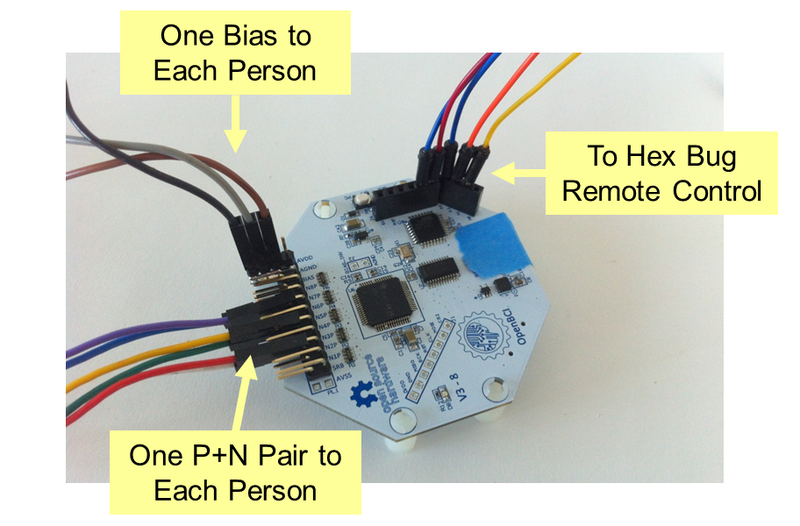 Individual Reference: To allow each person to use their own reference electrode, we configured the software on the OpenBCI board to put the ADS1299 EEG chip into per-channel differential mode. Unlike our normal mode of operation, which uses a common reference electrode via SRB1 or SRB2, this differential mode allows each channel (ie, each player) to have its own reference. This is what we want! We simply plug the O1 electrode into the channel's "P" input and the ear lobe reference into the channel's "N" electrode. 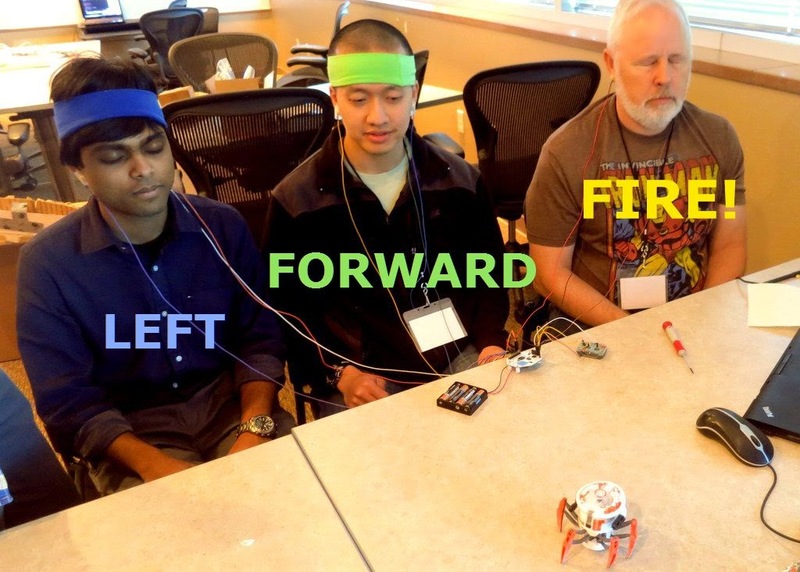 Common Bias: The only tricky part is that we want all four players to be connected to the OpenBCI Bias. 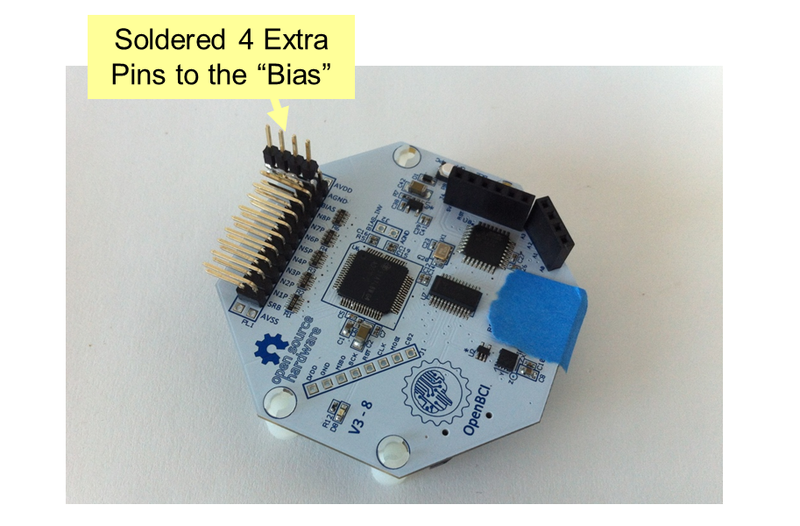 This is tricky because the OpenBCI board does not have four Bias pins. Well, as you can see below, all it takes is a soldering iron and you can connect a piece of pin header to turn the single Bias pin into four Bias pins. Now we're hacking! Connecting the Pieces: The picture below shows all the connections to the OpenBCI board assuming three players. On the lower left, we've got three pairs of wires (one pair for each player) plugged into the "P" and "N" inputs of three different channels. Then, in the upper-left, you see three wires plugged into three of the four new Bias pins. Finally, in the upper-right, you see five wires that go off to command the hacked Hexbug remote control. Making It Happen: Being a rare thing that me and Joel and Conor are all together, it was really fun that we could work together to make this hack happen. Joel worked the soldering iron to attach the pins and he modified the Arduino code running on the OpenBCI board to enable the per-channel differential mode. Conor further modified the Arduino code as well as the Processing GUI to enable slower turning of the robot (originally, it was turning WAY too fast). Then, I modified the Processing GUI to enable Alpha detection on the four individual players. We did all this in parallel. I'd never really done group-hacking before. It was definitely fun. Conor and Joel working through the details of the connecting the Hexbug remote control. Testing It: Once we pulled together all of the pieces, Conor and I began to test the complete setup (see pic below). After a little tweaking, we got the whole system working, as shown in the video at the top of this post. It was a group effort that worked out. Pretty sweet. Conor and Chip -- Two Brains, One Robot. Breaking Robots: So our original vision was to get this hack working so that we could have *two* 4-person teams, with each team controlling their own robot. Luckily, we had multiple robots and multiple OpenBCI boards, so we thought that we could make it happen. Unfortunately, as soon as Conor and I made our video, the robots started to break. They don't like being stuffed in suitcases, I guess. So, we were left with just one working robot. Bummer. Recruiting a Team: At the AF LabHack, there were lots of folks doing their own hacking. By the time we got our system working (with the one healthy robot), the other teams were scrambling to get there last results prior to presenting to the group...so we had a tough time recruiting volunteers for being part of a robot-control team. In the short time we had left, we did get three enthusiastic folks step up. We got them all equipped with EEG electrodes, tuned the system a bit and let them play! Our Fine Volunteers. Three Brains, One Robot. No Video: At this point, we should be presenting a triumphant video. Unfortunately, we don't have one. If we did, what you'd see is that two of the three players could easily and repeatably use their eyes-closed Alpha waves to command the robot. It was cool to see. No Alpha: The third player, though, did not have much luck controlling his part of the robot. At first, I assumed that it was a problem with our system, but after a little debugging, I came to the conclusion that his brain simply wasn't generating eyes-closed Alpha. He could have been trying too hard (you must be relaxed, without concentrating or being overly focused), or he could have been part of the 11% of the normal, healthy population that simply does not generate Alpha upon closing their eyes [Ref 1]. For these folks, I've got to come up with an alternate robot-control methodology...perhaps by the concentration signature of counting-backwards-by-three. Next Steps: The next steps are clear -- I have to get a bunch of people together, hook them up, and enjoy the shenanigans of many brains trying to control a single robot. Should be fun! Follow-Up: We used a similar approach to get a 5-person team to brain-control a swimming shark balloon. It's cool. Check it out here. Hey Chip, we've beaten you by 1 month, presenting NeuralDrift, a 2 player neurogame, at WearHacks in September 2014. The idea is based on Pacific Rim, where 2 players have to sync their brain activity to control a robot (Lego Mindstorm EV3). NeuralDrift supports Emotiv / Neurosky / Muse / Enobio, each player wear it's own favorite headset ! Love what you do with the OpenBCI ! Can't wait to have mine. It's not about competition, it's about getting people excited and inspired. The more the merrier! Thanks for the link to your work...pretty cool! Very cool :-) Your blog is awesome Chip! Hey Chip. Do you know if it's possible to change the sample rate of the Open BCI. In your wide experience with this device, do you know what is the bandwidth we can work? Thanks. The sampling rate of OpenBCI can be increased. I think that EEG chip at the heart of OpeNBCI can go up to 16kHz or something. But, the OpenBCI board also uses a microcontroller and wireless transmitter to pull the data from the EEG chip and send it to a PC. Those components are more limited in what they can handle. If you've got the 32-bit OpenBCI board (which is all that they sell now), I think that the total capacity is something like 8x250 = 2000 samples per second. You can divide up that capacity among however many EEG channels you'd like. Note that this is merely my expectation, based on my experience with the system. I have never personally tried to run it any faster than its default speed (250 samples/sec). If you want to change the speed, you'll likely have to reprogram the OpenBCI board itself. All of the software is open source, but it'll take some effort to figure it out. Heyy, thank you very much for your clear explanation. We read and discuss your search on class with the master and phd students. This thank from all students and professor in my class..